All-rounder Vijay Shankar takes a screamer on the boundary to send Colin Munro packing for 34 in the opening encounter of the three-match T20I series between India and New Zealand at Westpac Stadium in Wellington. 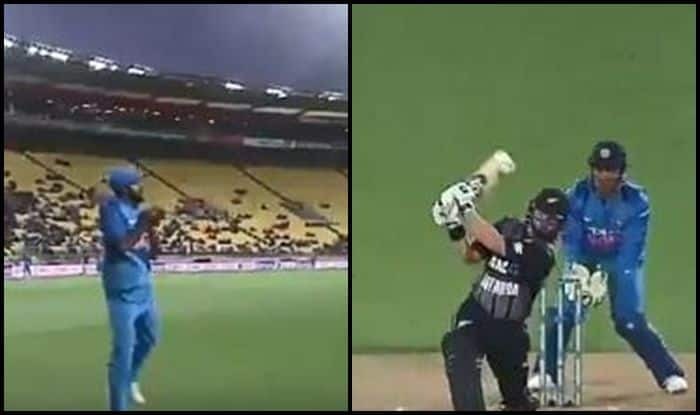 1st T20I India vs New Zealand: It was Krunal Pandya who brought an end to Colin Munro’s breathtaking 20-ball 34 in the ongoing 1st T20I between India and New Zealand in Wellington. It was Vijay Shankar who took the catch in the boundary rope. Shankar balanced himself well and kept a good distance from the ropes to complete the catch cleanly. It was a massive wicket in the context of the game as the openers were taking it away from the Men in Blue. Munro’s cameo was laced with two sixes and fours. The wicket of Munro came in the ninth over of the match when the Kiwis were on 86/0. Earlier, India captain Rohit Sharma won the toss and elected to field first against New Zealand in the first match of the three-T20I rubber at Westpac Stadium in Wellington.